I just came back from Vmware Seminar 2010. There are lots of information I would like to share with you. You can clearly see where Vmware is heading for it’s own future. You may heard some news about VmForce (Vmware combine with Salesforce to make cloud level ERP system), Vmware acquired SpringSource and public cloud, private clound. I was quite confused before I attended this seminar since I could hear everyone is talking about cloud but no real clouds system for private enterprise to merge or any real cases about cloud. This puzzle is resolved by this Seminar. Using VMSafe products (like Trend Macro, Agentless anti-virus. It will be available very soon). Hybrid cloud (It’s also called Redwood project. This is next generation VM OS. If Private cloud is ready, meaning all apps can run on VMkernel without MS OS. Any apps can be seamlessly transferred between private cloud to hybrid cloud and even public cloud). In terms of convincing CIOs and IT Managers to purchase equipment to do VM DR and 100% virtualization, Vmware put lots of efforts on CapacityIQ, ChargeBack, how to shift attention from CAPEX to OPEX during the seminar. It only broadcasts one message. Come and virtualize everything! I agreed Vmware has drawn a beautiful picture of future I.T. But whether they can actually pull off this show is really a question mark. With all those components, like servers, Desktops, Networks, any parts of failure may cause huge disaster for Vmware. Vmware View is still not promising from angle of optimizing qos via WAN. PCoIP completely when it competes with Citrix ICA/HDX. Vmware users have to go back and use MS RDP protocol to connect Virtual desktop which gives Microsoft a chance to regain the market. Even in the latest demonstration, Vmware view still hasn’t fixed issue. From my personal understanding, Java applications has tons of issue. Slowness, stability problem. Novell has to dropped off Java console from Netware few years ago doesn’t mean anything to Vmware? This is part 2 of vDS (vNetwork Distributed Switch), My Understanding. What will your instructor tell you? “Please don’t consider vDS is a switch connecting to Hosts. vDS is just a template” Well, that’s what you always heard from all your instructors. but template of what? The answer is vDS is template of HIDDEN vSwitch sitting on your local host. vDS(the template) is managed by vCenter(high level operation) and your local Host(low level operation). Let’s see a diagram. From this diagram, you can see there are two hosts. Each host has hidden switch which received template (vDS) from vCenter. The local template will be updated every 5 minutes like what I mentioned in Part 1. Now, let’s open this hidden switch and see what’s happening in there. As you can see, the hidden switch has forwarding engine and teaming engine which will be configured and controlled by setting in vCenter. 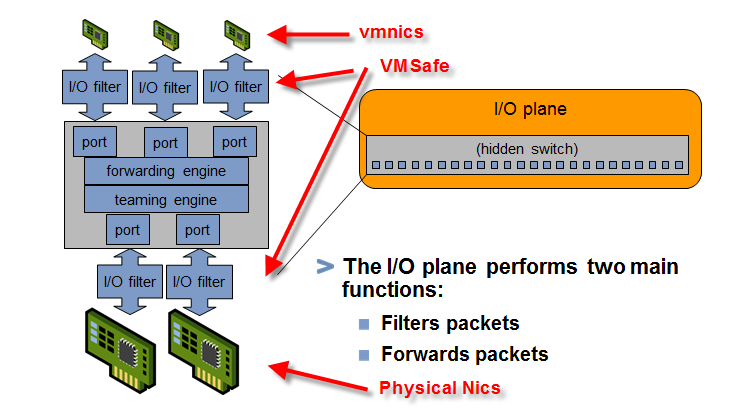 There are two IO filters (not just one) is to be used in VMSafe. So what VMSafe does is let third party software (for example, the Trend Micro) build a VM appliance and be certified by VMWARE to prove it won’t do any damage. That special VM will use special API to monitor traffice (like firewall) or check virus. Meaning, if you want to use VMSafe product, you have to use vDS, meaning you have buy Enterprise Plus license! I guess that’s why VMSafe product is not popular. ok. Back to vDS. Let’s make a small conclusion. vDS is also a vSS. But it’s hidden in the Host. This hidden vSS is using template made by vCenter and Local Host so you can control traffic and share switch data between hosts. vDS is capable to do everything vSS can do because it’s basically a super (hidden) vSS. Once you assign a vmnic OR VMkernal, SC or VM to vDS, you won’t be able to use them in vSS. It’s same thing as vSS. I won’t say there are not much point to use vDS but if you do want to use vDS, you would either use Cisco Nexus to replace vDS or you want to use VMSafe product. Or you have Enterprise Plus license and want to use host profiles. vDS is not as convenient as vSS which only connects to single Host. sometimes, it’s not easy to remove vDS switches or even switch physical nic to different vDS switches. 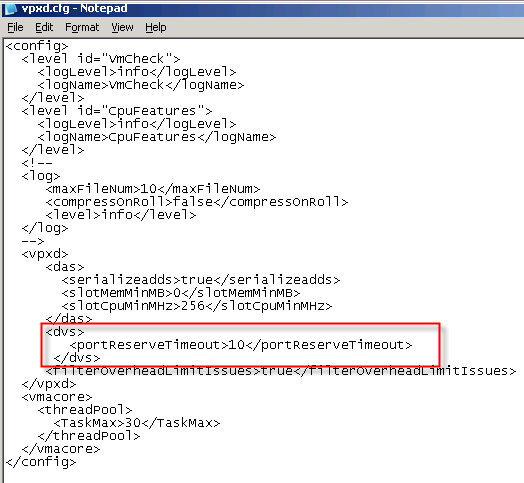 If vDS believes a port is busy, vCenter won’t allow you to delete vDS or remove a host from it. By the default, vCenter automatically forces all “busy” ports on all distributed switches to time out every 24 hours. You can make change on vpxd.cfg to make it as 10 minutes. In vpxd.cfg, add the line <vpxd><dvs><portReserveTimeout>10</portReserveTimeout></dvs></vpxd> and save the file. Restart vCenter. The default timeout is now set to ten minutes. After the port reservation has timed out, remove the vNetwork Distributed Switch or dvPort group. Reset the default timout by removing the line you previous added to vpxd.cfg. If you run into problem with vDS, always start checking from vCenter->Networking level. Because it has general view to tell you all vDS details such as IP on each port group, PVLAN info and which VM or kernal ports it connects. Then, you should drill down to single host ->Configuration->Networking to add or remove objects. If you do have issue, try to remove all objects to another vDS and then, make your change. For the rest of details, like PVLAN, blocking of individual ports, you can check this file to continue your journey of vDS. vSphere has introduced many new features. One of new feature is vDS (vNetwork Distributed Switch) which always confuses me and lots of people. I’m trying to explain it as simple and easy, also deep to you as I can. If I make any mistakes, please feel free to leave comment. Thank you. So What is vDS? What’s difference between vSS and vDS from configure file structure? 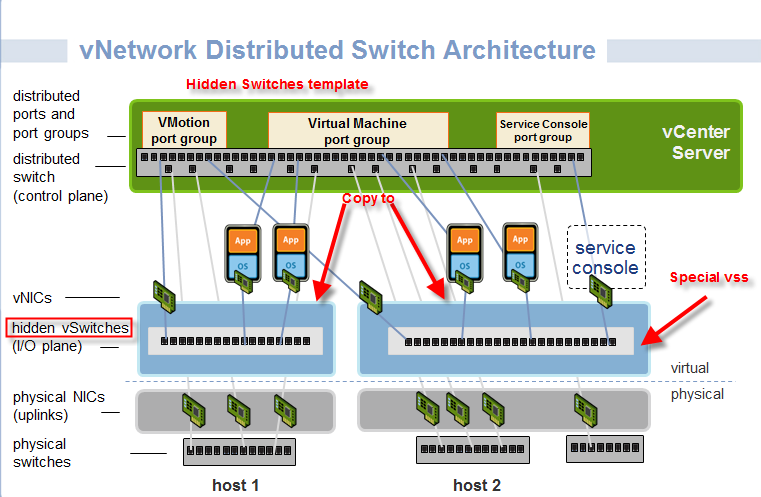 vDS is a new Virtual Switch introduced by Vmware. The old vSS is more like local Host property. All switch data saved in the local Host. Other Host is not aware what kind of vSS other Host has.Not only vCenter can’t do anything about it, it causes trouble when you do vMotion. vDS is saved in both vCenter and Host. One copy in the vCenter, vDS is saved in the SQL database. In the local host, vDS has another local database cache copy sits at /etc/vmware/dvsdata.db. This local cache will be updated by vCenter every 5 minutes. You can use following command to help you to get copy to read the local host database. 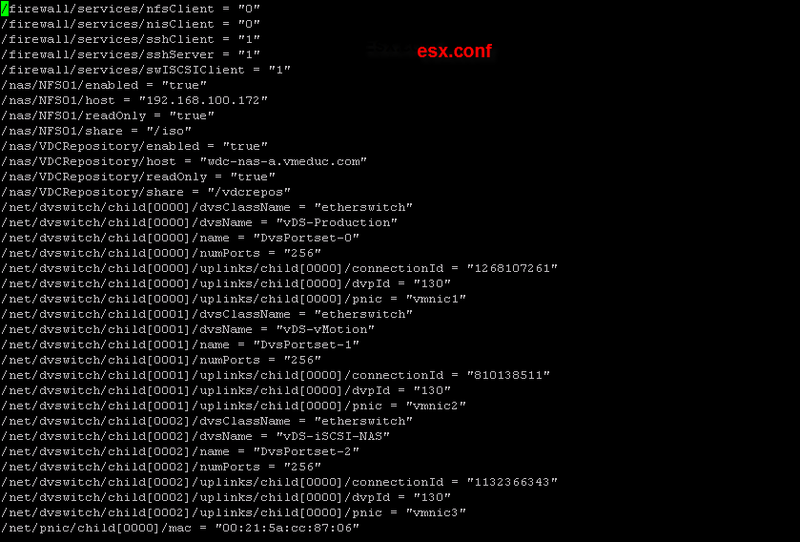 Also, after you configure vDS on your local host, your esx.conf (/etc/vmware) has record shows brief configuration information of vDS. Those 3 configuration combines vDS structure. This also makes vDS can work even after Host disconnected from vCenter. What’s difference between vSS and vDS on control level? With vSS, everything should be controlled on local host. Basically, you go to Local Host->Configuration->Networking. Then, you start everything from there. But vDS is different. vDS divide control into 2 different level. I call them high level and low level. High Level: High level is to create/remove, management teaming, distribution port group etc. This level sits at vCenter->Inventory->Networking. Low Level: This level is to connect your vm, vmkernel, and your local physical cards to vDS. Please be aware that your vm, vmkernel, etc are connecting to distribute port group. Unlike local vSS (you have create same vswitch, same vswitch port group on all hosts), vDS is pushed from vCenter to all Hosts. As long as you are connecting to same vDS, you will have same distribute port group. With local physical nic card, they need to connect to dvUPlink side. You can choose any number of local nics to connect or even no nic at all. But what you can’t do is to setup teaming (only work for 2 nics from same host), traffic shaping, VLAN because you need to setup on high level.